The ultramodern look of the sleek Ressence Type 3 is incomparable. The black and white face is simple yet sleek and there is no denying that the convex curve of the glass and the liquid filled dial, gives this watch an appearance like no other. 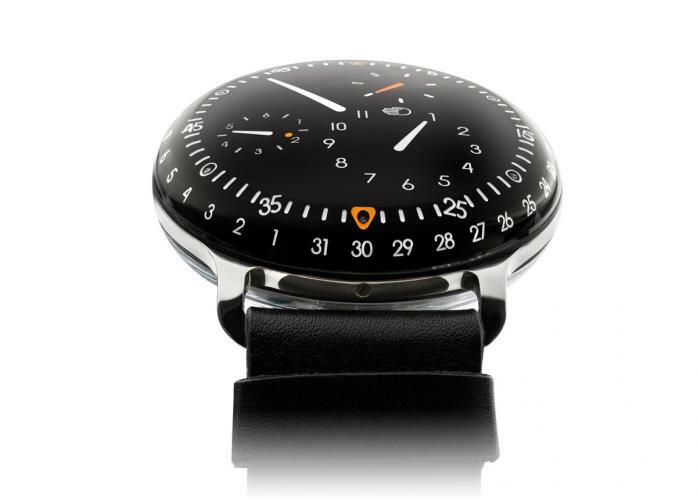 Don’t look for the crown on the Ressence Type 3, you’ll have to wound it up by turning the case back. Like the dial side, the back is curved convexly so that its centre touches the wrist between the bones, ensuring that the Type 3 is a very comfortable watch to wear. One of the most striking features of the Type 3 is its surface time display that, while not using traditional hands, uses the concept of hands to display the time. The Type 3 displays time as if it were projected onto a screen. Unlike watches with hands, where several layers of information are superimposed, the Ressence display system projects the information onto the outside of the sapphire crystal, eliminating the last perceptible barrier between the dial and the eye – the refraction of the glass. The brain uses reflection and refraction to understand shape and depth. Filling the display with fluid removes the visual reference points that the brain uses to perceive the shape. The effect is amplified by the play of shadows on the spherical dial: It has to be touched to be believed. The dial and indications are curved (radius 125mm) and treated with DLC (diamond-like carbon). All the components are titanium with the exception of the gears. The indications, engraved in the discs are filled with Super-LumiNova (white, grey and orange). 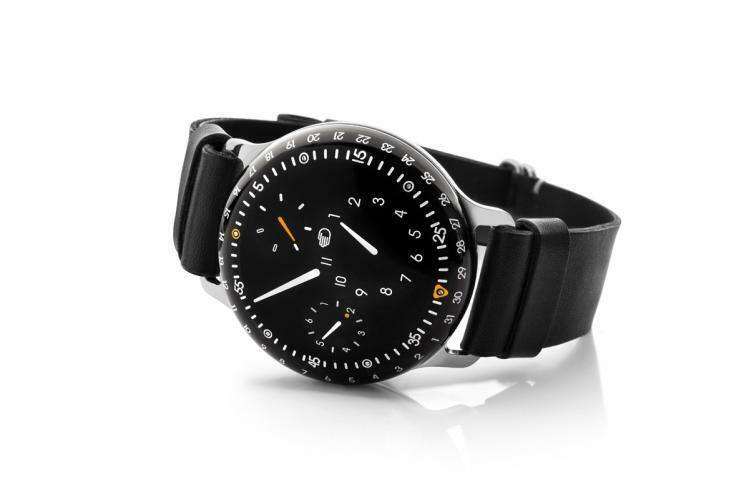 The display system has been invented developed and patented by Ressence and comprises 28 gears and 57 jewels (out of 82 jewels in total), three offset bi-axial satellites and an exterior date ring. The upper module also includes a gimbal, a shock absorption system and is totally filled with fluid. A thermostatic valve system allows for any expansion or contraction of the liquid due to the ambient temperature. By virtue of the convex curve of the dial, the angle of the satellite indications is approximately 3° for the hours and 4.75° for the seconds. Sandwich construction with titanium membrane between movement and fluid-filled indication module. Information transmitted from movement to indications by micro-magnetic fields . Shock absorber system including gimbal system. Total: 407 components, module alone: 287 components. 2011: ZeroSeriesOne launched. This was a pre-production series of 50 pieces (30 in aluminium, 20 in titanium). 2012: SeriesOne launched bearing the ‘Swiss Made’ label. 2013: Launch of Type 3 at Baselworld 2013. Born in Belgium, Benoît Mintiens initially planned to be a naval engineer, but then decided on a career as an industrial designer. He graduated in Industrial Design in Antwerp in 1998 and took up the position of Senior Consultant at Antwerp design firm Enthoven & Associates. While he was working at there, he also gained his MBA at Vlerick Business School in 2003. Benoît Mintiens had always been attracted to the idea of creating a new kind of watch. Around 2004, a friend presented him with an opportunity to do just that when he asked him to create an original design for a men’s watch featuring as many diamonds as possible. Benoît chose to use diamonds for their functional attributes and in particular their refractive qualities. But while he was working on a prototype, another brand launched a model based on a similar idea to his own, and Benoît’s design was put on hold. His appetite for watch design had been whetted and in 2007 Benoît finished designing his first watch, the SeriesOne which included Ressence’s now iconic rotating flat discs, which replaced traditional hands. 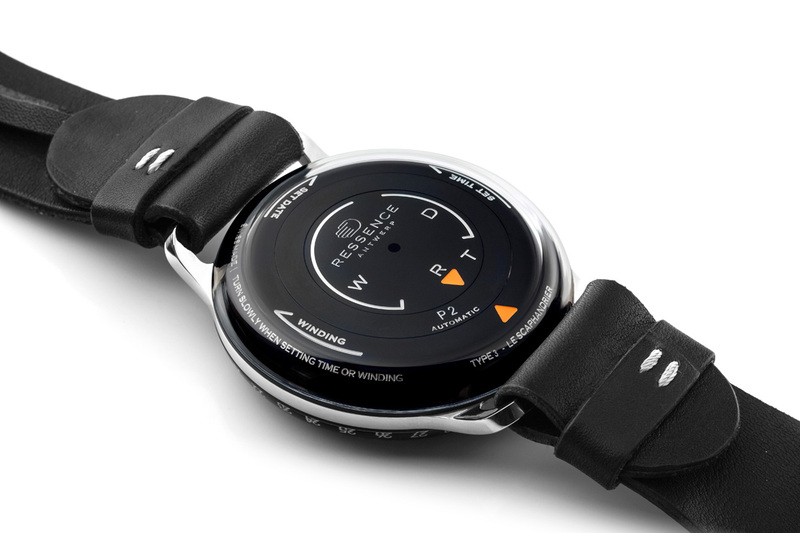 In 2009 Benoît founded Ressence and launched the brand at Baselworld the same year. In January 2011, the SeriesOne watch was awarded second prize in the Super Watch Awards organised by the Geneva Time Exhibition, with it gaining a special mention from the jury.